This cute and easy crochet flower for beginner pattern is different from most of the patterns we’ve seen. It has six petals that are long and pointed and together create the most adorable flower applique. This flower can be used in so many ways that are both attractive and decorative. You can make a few and join them to create a table runner, or a beautiful garland for example. Use colors to create something unique or color schemes with beige to create the vintage feeling. 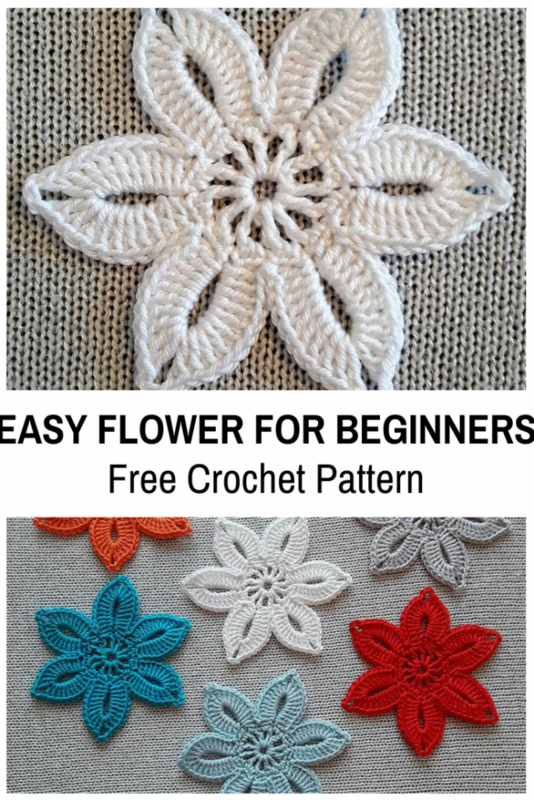 This pattern, courtesy of NotikaLand Crochet And Knitting is an easy, free crochet flower pattern that any beginner can make. Thanks to NotikaLand Crochet and Knitting for the article inspiration and featured image. Thanks. This video was not on original post. Several of uour patters on face book are the same unfortunately. Can’t find the written pattern for the beginners easy flower. All of your links take me to ads. Can you email me the written pattern? Any chance you have this as a written pattern? I’m having trouble seeing where she’s placing the sts in the video.